Good Charlotte singer Joel Madden told the Los Angeles Times that he’s "the best he’s ever been" thanks to fiancée Nicole Richie and their two kids – Harlow, 2 years old, and Sparrow, 7 months old. "I have two kids that are my life – they’re my entire world," he says. "I have an awesome partner who is really supportive. She makes me the best version of myself that I’ve ever been." Madden also told the newspaper that fatherhood has been a welcomed change in his life. "My kids make me feel good about myself. I’m not really worried about succeeding or failing," the 31-year old said. Feedback for tracks from his band’s next album, Cardiology, is up to his daughter, Harlow. Even though she’s just 2, Madden insists he values her opinion most. "She says yea or nay when I record a demo. She gives me the honest reaction." Madden and Richie have been together since 2007 and are currently engaged to be married. 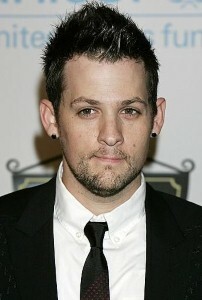 Good Charlotte’s new album will be released in May and will mark the band’s 10-year anniversary.